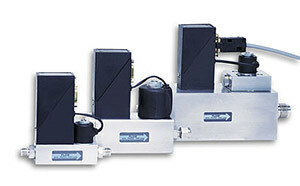 The FMA-700A/800A series has been discontinued. Please see the FMA2700/FMA2800 and FMA3700/FMA3800 series as a possible alternative or contact our Flow Engineering department. The OMEGA™ FMA-700A and 800A Series mass flowmeters and controllers extend the range of mass flow measurement and control from 0 to 5 SCCM to 1000 SLM with 50:1 turndown capability. Like all mass flow sensors, these new units measure mass flow rate directly, without the need for temperature or pressure corrections. The FMA-700A and 800A Series work on the heated bypass sensor tube principle. The units feature corrosion resistant stainless steel and FKM construction and a 325 mesh (44 micron) inlet screen to prevent contamination of the sensor. The flow body and valve leak less than 10-8 atm-cc/sec of helium. In the event of a power failure, the valve is normally closed. The FMA-78P2 and FMA-78P4 are 2- and 4-channel readout/power supply/setpoint control electronic boxes for use with FMA-700A and 800A Series mass flow sensors. The units feature 000.0 to 102.4% of full scale display, a ±15 Vdc power supply, setpoint potentiometers (for mass flow controllers), power cord, and an electrical connector for hookup of the electronics boxes’ outputs. The FMA-78P Series rate indicators/electronics packages also have back-panel blend control switches that select independent/slave operations for each channel (channel 1 is the master), and the units include a 0 to 5 Vdc output for each channel for chart recording, data acquisition, or computer interfacing. Standard: 0 to 5 Vdc into 2000 Ω min. 참고: Comes complete with operator's manual and mating connector.